Skiathos International Airport "Alexandros Papadiamantis"
Skiathos Airport ‘Alexandros Papadiamantis’ (IATA: JSI, ICAO: LGSK) is an airport on the island of Skiathos, Greece. Its 5,341-foot runway is able to accommodate aircraft up to the size of a Boeing 757-200. The runway is characterised as 'short and narrow'. Because of the uneven terrain on the island of Skiathos, Skiathos Airport was created by reclaiming land from the sea between Skiathos island and the smaller island of Lazareta (a former leper colony) effectively joining the two islands into one larger island. The airport's short runway and its proximity to an adjacent public road have made it a popular destination for planespotters. It is often compared to Princess Juliana International Airport on Saint Maarten since both airports offer the public an ability to legally experience landing approaches and takeoffs at very close range. The airport first operated in 1972. A passenger terminal and a new control tower was constructed in the late 1980s. The new and the current passenger terminal which opened in 2002, to better accommodate the growing number of passengers. Skiathos Airport has no jetways, meaning that you have to walk the short distance from the aircraft to the terminal building. From 2014, there was extension to the runway and a new taxiway was introduced. The runway was extended by 110 metres on the north side of the airport, which opened in summer 2014. An extension was added to the taxiway, for an additional 4–5 parking stands. Before the construction began, the airport had the capacity for only 2–3 additional parking stands. This opened in 2016. In December 2015 the privatization of Skiathos Island National Airport and 13 other regional airports of Greece was finalised with the signing of the agreement between the Fraport AG/Copelouzos Group joint venture and the state privatization fund. "We signed the deal today," the head of Greece's privatization agency HRADF, Stergios Pitsiorlas, told Reuters. According to the agreement, the joint venture will operate the 14 airports (including Skiathos Island National Airport) for 40 years as of 11th April 2017. On 22 March 2017, Fraport-Greece presented its master plan for the 14 Greek regional airports, including the Skiathos International Airport. Skiathos Airport is located 4.5 km from the city of Skiathos and is accessible either from Skiathos ringroad or the coast road. The journey to and from the city centre takes about 10-15 minutes, depending on traffic. 24/7 metered taxi service is available outside the Skiathos Airport Terminal building. 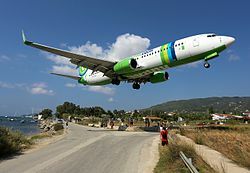 ^ "SKIATHOS AIRPORT "A.PAPADIAMANTIS"". Retrieved 9 January 2018. 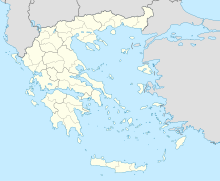 ^ "Greece signs privatization of 14 regional airports with Germany's Fraport". tornosnews.gr. December 14, 2015. Retrieved July 16, 2017. ^ "Greece signs major privatisation deal with Germany's Fraport". uk.reuters.com. December 14, 2015. Retrieved July 16, 2017. ^ "Fraport Greece Begins 40-Year Concession at 14 Greek Regional Airports". fraport-greece.com. Retrieved July 16, 2017. ^ "Blu Express Adds New Milan Bergamo – Greece Seasonal Routes Jul – Sep 2015". routesonline.com. May 21, 2015. Retrieved July 16, 2017. ^ "Blu Express Adds Bologna – Skiathos Seasonal Route July – Sep 2015". routesonline.com. May 22, 2015. Retrieved July 16, 2017. ^ "Condor Plans New S15 German Short-Haul Routes". routesonline.com. September 15, 2014. Retrieved July 16, 2017. ^ "Finnair Adds New European Routes in S16". routesonline.com. August 21, 2015. Retrieved July 16, 2017. ^ a b "Flight". apollo.no. ^ "Thomas Cook Airlines". Thomas Cook Airlines. Retrieved July 16, 2017. ^ "Volotea". Volotea. Retrieved July 16, 2017. This page was last edited on 23 March 2019, at 22:51 (UTC).